Kids Backcountry Fishing With The Teton Fly Fishing Rod From Tenkara Rod Co. Pack goats seem to be a going thing in that general area of the country. A few years ago I followed and watched several videos of a group of mobile amateur radio enthusiasts in Colo. (Steve WG0AT) that used Steve’s own pack goats (Peanut and Rooster) to haul their gear into the high mountains and operate their grp (low power) ham radio stations over the weekend. An activity called SOTA, summits on the air. This is such a neet idea, I looked into pack goats years ago and found huge pushback from some environmental groups. Granted much of the concern is 100% nessary because most of the decline of native big horn sheep was caused by intriduced pathogens from early sheep hearders, if only people would take into consideration proper vaccinations would entirely prevent any such contamination now. I’m an amateur radio operator who also enjoys backcountry adventures and have thought about getting a lightweight QRP rig to do SOTA, but that would take limited time and $$$ away from fishing. I do use a mobile VHF radio with APRS (automatic packet reporting system) to send email-texts to Mrs Brian with GPS coordinates she can click on to see a map that shows where my wanderings have taken me when fishing remote water solo. Tyson, Locally, well kind of local, 2 hours away, I think there are or were a couple of outfitters operating in the New River gorge that supplied pack Llamas. A guy in my home county raises llamas, harvest the wool and sends it off to someplace in Vt, where it is made into yarn, knitted into socks, and gloves, etc. I guess he is still in business. I have only seen the guy at the annual hunting and fishing show at the civic center. Pack llamas in New River gorge seems more of a novelty thing to do than something useful. Maybe llamas don’t have the risk of the same pathogen effecting local wildlife as goats. However, a lot of the environmental groups are whackjobs that whine about everything. Several of them come here, from out of state, all the time to protest coal mining. But they don’t walk here and camp out in summer heat. If they did they would have more credibility. They fly in or drive in and stay in a/c hotel rooms with all the conveniences provided at the flip a power switch. Taking advantage of the conveniences provided by the processes they come to protest. Electric power, a/c or heat is only produced by some process that increases entropy. Most people don’t want to return to a seventeenth century existence. That being said, I had been told that if I followed the road that runs past my house west over Mud mountain it eventually come out at the town of Hamlin, (hometown of Gen Chuck Yeager). Several years ago I road my motorcycle to Hamlin on that road. The road is gone in many places passing through the Hobet mining operation, that is quite terrible and disturbing to see up close. I dislike mountain top mining operations as much as they do. It is especially environmentally damaging, and imo better options are available. Brian. I can’t really say I am an amateur radio op any more because I haven’t set up and operated any of my radios for a long time. Just renewed my license (WO8W) in Dec. via W5YI. I kept waiting for the new license to arrive in the mail. It didn’t. Called W5YI in Feb. to ask why I hadn’t received it. And learned something new - the FCC stopped issuing printed licenses four years ago. You have to go to an FCC website, find and download a pdf file of the license. I do have a few radios that would work well for pedestrian mobile ops. Yaesu FT-817, Icom 703 and SGC 2020 ADSP. Purchased some Powerwerx Anderson wp30-10 powerpoles and wire 3 years ago to make nice power cables that would make it easy to switch between using any of the radios, but never got round to assembling them. I mostly prefer qrp cw ops. Never cared to much for chatting with a microphone or the various digital modes. Preferring personal brain skill over electronic gadget decoding. But I was never very good at copying morse code in noisy outdoors locations. I was just getting to the point where I could hear and copy whole words, rather than individual letters, sitting at a nice quiet table, at about 18 wpm when it was sent with good rhythm, then other facets of life pushed ham radio off my priority list. I’m quite rusty at it now. I have Blackcat Morse Mania app on my iPad & iMac, and fire it up now and again as an easy way to try to gain back some competence. I haven’t played with ham radio or shortwave listening for so long I wasn’t sure if the old “spy numbers” stations were still operating till I looked it up. The morse codes one were good at honing copying skills. Seems they’re still a going thing. Anyway, I think this has drifted too far away from tenkara in the back country. A really stiff tenkara rod with light enough wire might make an ok high band wire antenna support. Fish during the day, do ham ops in the evening by the camp fire. But I think I would only try it with a cheap pole I wouldn’t be upset about if it broke. I mostly prefer qrp cw ops. Never cared to much for chatting with a microphone or the various digital modes. Preferring personal brain skill over electronic gadget decoding. K7BDM here, only licensed since 2015 to be able to use VHF handhelds in the backcountry, but now hold an Extra and VE. My wife and I met in the USAF 39 years ago. She was a RO. My older bro trained as a RO in the Army. After getting out he was an amateur “diddy bopper” (AF nickname for cw operator ) and I’d like to learn cw when I have time. I don’t really do the rag chew thing either. And for now 95% of my radio time is spent volunteering for contingency HF emergency comms with the federal govt using voice, digital modes, and encryption. They’re not certified for the services so it’s (technically) illegal but I can program my VHF - UHF handhelds for FRS - GMRS and low power for my unlicensed fishing buddy and I to stay in touch while Tenkara fishing remote high country lakes and high gradient streams. There is an extensive network of APRS digipeaters and VHF-UHF repeaters used by amateurs and SAR orgs out here so that’s an added measure of safety that I have access to without having to pay a monthly-annual subscription for and in 3 years I’ve only found one drainage that I can’t get comms. I completely agree, I consider myself fairly in tune with nature, while “environmentalists” rarely come from my area, experience my areas, live with the nature of the local surrounding area but want to legislate and govern how we locals use the environment. No one cares more than the people emerged in the natural area they live in. Enough of the soap box… there is a person near me that uses llamas for packing, from what I understand they are a bit more picky about food sources and tend to spit on people passing by, could either be a good thing or bad. Until it’s made illegal I would absolutely consider goats. Hey, I was an RO too, in the Navy. But in that case, a nuclear Reactor Operator. Different kind of RO. That was a fun thing to do. Parts of it anyway. Back to tenkara and kids. 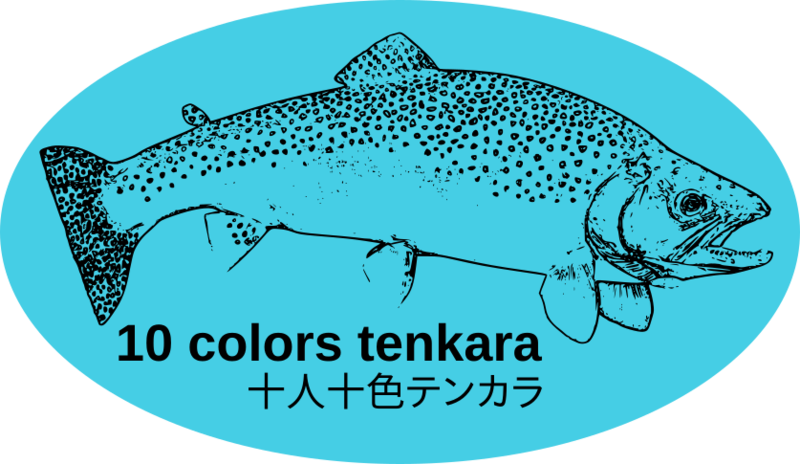 Badger Tenkara was, from what I have read, pretty active in promoting kids tenkara fishing. I believe they were associated with the Boy Scouts and provided their rods to scouts at the National Jamboree, that is held every four years. They may have also been involved during the annual summer events at the larger scout centers. Their closing shop is a setback for introducing children to fly fishing. Seems like I briefly met Matt at the Tenkara Jam a couple of years ago. but maybe it was someone else and I’m just recalling who it was incorrectly.